What Day Of The Week Is July 12? 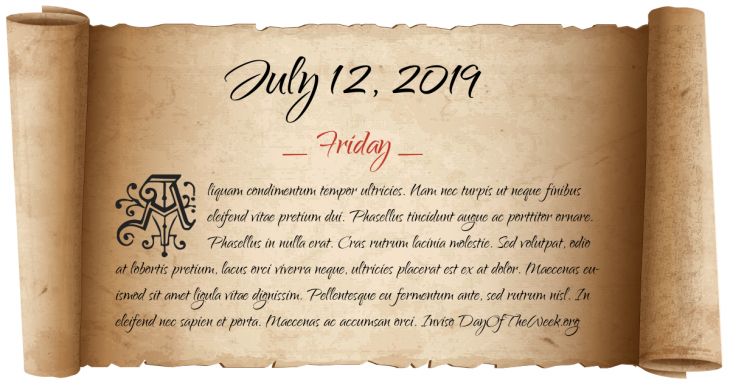 July 12, 2019 is the 193rd day of the year 2019 in the Gregorian calendar. There are 172 days remaining until the end of the year. The day of the week is Friday. King Henry VIII of England marries his sixth and last wife, Catherine Parr, at Hampton Court Palace. Saint Basil’s Cathedral in Moscow is consecrated. The Civil Constitution of the Clergy is passed in France by the National Constituent Assembly. Pune floods due to failure of the Khadakwasla and Panshet dams. Half of Pune is submerged, more than 100,000 families need to be relocated and the death tally exceeds 2,000. The Rolling Stones perform their first ever concert, at the Marquee Club in London. São Tomé and Príncipe declare independence from Portugal. U.S. Army Apache helicopters perform airstrikes in Baghdad, Iraq; footage from the cockpit is later leaked to the Internet. Who were born on July 12?